Jisr ash-Shugur (Arabic: جسر الشغور‎, pronounced [dʒɪsr aʃˈʃuɣuːr], Turkish: Cisr eş-Şuğur also spelled Jisr al-Shughour) is a city in the Idlib Governorate in northwestern Syria. Situated at an altitude of 170 metres (560 ft) above sea level on the Orontes river, the city was inhabited by 44,322 people in 2010. Jisr ash-Shugur has long been an important stopping point on trade routes and is situated on the main route between Latakia, 75 kilometres (47 mi) to the west and Aleppo 104 kilometres (65 mi) to the east. Located in the rich alluvial plain of the Ghab valley on the eastern side of the An-Nusayriyah Mountains (also known as the Jebel Ansariye), the area has been continuously inhabited for over 10,000 years. The ancient city of Qarqar is thought to have been situated some 7 kilometres (4.3 mi) south of the modern town, which was established in Hellenistic times as the city of Seleucia ad Belum. The Romans called it Niaccuba and built a stone bridge there across the Orontes. Little remains of the ancient city other than portions of the much-repaired Roman bridge, which is now incorporated into a 15th-century Mameluke construction that still serves as one of the city's two bridges over the river. The bridge's V-shaped design was intended to enable it to withstand the force of the river's current. Although Jisr ash-Shugur is mostly of modern construction, a number of old Ottoman-era buildings still survive including a caravanserai built in the centre of the old town between 1660–75 and restored in 1826-27. The city has been described as conservative and predominately Sunni Muslim with a history of unrest against the government of the ruling secular Arab nationalist Baath party. It was the scene of a mass killing by Syrian security forces in 1980 that prefigured the later and more notorious Hama massacre. On 9 March 1980, against a background of anti-government protests across Syria, inhabitants of Jisr ash-Shugur marched on the local Ba'ath Party headquarters and set it on fire. The police were unable to restore order and fled. Some demonstrators seized weapons and ammunition from a nearby army barracks. Later that day, units of the Syrian Army Special Forces were helicoptered in from Aleppo to regain control, which they did after pounding the town with rockets and mortars, destroying homes and shops and killing and wounding dozens of people. At least two hundred people were arrested. The following day a military tribunal ordered the execution of more than a hundred of the detainees. In all, about 150–200 people were said to have been killed. Violence broke out in Jisr ash-Shugur on 4 June 2011, three months into the Syrian civil war. Armed groups attacked local security forces, killed 120 members of the security forces and seized control of the city, with many civilians fleeing to Latakia. Activists speaking to BBC denied the government's version of events, claiming that the deaths were unclear and that they might be killed by their own side for mutiny. The Syrian military launched an operation in a crackdown against the claimed armed groups. The operation lasted until 12 June 2011. The city was reported[by whom?] to have been largely abandoned by its inhabitants, many of whom fled to neighbouring Turkey, as Syrian Army units massed outside to retake it. In December 2011–January 2012, FSA took control, establishing a key rebel center. ln June 2012, the FSA was still in control. 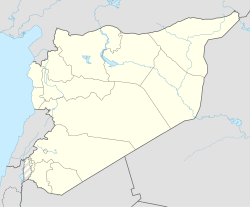 In October 2012, the Syrian government was reported by Al Jazeera to be in control of the town. However, on 25 April 2015, the city was captured by an alliance of Salafist insurgents, including al-Qaeda's al-Nusra Front, Ahrar al-Sham, and the Turkistan Islamic Party. The city has become a stronghold of the TIP, and reportedly 3,500 Uyghurs have since settled in the city. By July 2017, the city was under joint control of Tahrir al-Sham and the Turkistan Islamic Party. Syrian and Russian bombing of the city resumed in September 2017. Wikimedia Commons has media related to Jisr ash-Shugur. ^ a b c ""Tahrir al-Sham" denies "Turkistan" full control of the bridge vacancy". Enab Baladi. 16 July 2017. ^ Günümüzde Suriye Türkmenleri. — Suriye’de Değişimin Ortaya Çıkardığı Toplum: Suriye Türkmenleri, p. 21 ORSAM Rapor № 83. ORSAM – Ortadoğu Türkmenleri Programı Rapor № 14. Ankara — Kasım 2011, 33 pages. ^ "Syria: largest cities and towns and statistics of their population". World Gazetteer. Archived from the original on 5 January 2013. Retrieved 7 June 2011. ^ Yamada, Shigeo (2000). The construction of the Assyrian empire: a historical study of the inscriptions of Shalmanesar III relating to his campaigns in the West. Culture and history of the ancient Near East. 3. BRILL. p. 155. ISBN 978-90-04-11772-3. ^ a b Burns, Ross (1999). Monuments of Syria: an historical guide. I.B. Tauris. p. 139. ISBN 978-1-86064-244-9. ^ Mannheim, Ivan (2001). Syria & Lebanon handbook: the travel guide. Footprint Travel Guides. p. 366. ISBN 978-1-900949-90-3. ^ Human rights in Syria. Human Rights Watch. 1990. pp. 16–17. ISBN 0-929692-69-1. ^ a b "Syria town of Jisr al-Shughour braces for army assault". BBC News. 7 June 2011. Retrieved 7 June 2011. ^ "Syria unrest: 'Deadly clashes' in Jisr al-Shughour". Bbc.co.uk. 2011-06-05. Retrieved 2011-06-12. ^ Chulov, Martin; Hassan, Nidaa (7 June 2011). "Syrian town empties as government tanks mass outside". The Guardian. Retrieved 7 June 2011. ^ Martin Chulov (18 May 2012). "Syrian security forces set off Damascus bombs blamed on al-Qaida – defectors". London: Guardian. Retrieved 2012-07-11. ^ "Rebel fighters 'capture' Syrian soldiers". Al Jazeera. 13 October 2012. Retrieved 13 October 2012. ^ "AFP news agency on Twitter". twitter.com. Retrieved 2 April 2018. ^ "Second Idlib Stronghold Falls to Jabhat al-Nusra and Rebel Forces". Institute for the Study of War. 27 April 2015. Retrieved 28 April 2015. ^ "Turkistan Islamic Party had significant role in recent Idlib offensive - FDD's Long War Journal". longwarjournal.org. 30 April 2015. Retrieved 2 April 2018. ^ "If Assad asks, China can deploy troops to Syria". timesofisrael.com. Retrieved 2 April 2018.